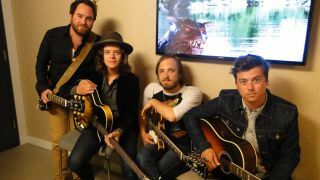 Wild Feathers members (from left) Preston Wimberly, Joel King, Taylor Burns and Ricky Young backstage in New York City. It's getting so that you can't turn on the TV anymore without catching The Wild Feathers - not that anyone is complaining. Already this year, the Nashville-based neo-Southern/country-rock quintet has played Jimmy Kimmel Live, Conan and The Late Late Show With Craig Ferguson, and last week the group headed to New York City to appear on Late Night With Seth Myers. And that's where we caught up with guitarists/vocalists Taylor Burns, Ricky Young and Preston Wimblery, along with bassist/vocalist Joel King (the group also includes drummer Ben Dumas), for a chat about their multi-axe mix and a look at their live instruments. The Wild Feathers aren't limiting their gigs to broadcast studios: The band is booked in the US through July, with performances at the Bonnaroo Festival in Manchester, TN, on June 12, and the Firefly Festival in Dover, DE, on June 21. Check out the video to the band's recent single Got It Wrong below. For more information, including tour dates, visit The Wild Feathers' official website. You can purchase the band's self-titled debut album at iTunes.